Our stores carry two lines of plantation shutters: premium window shutters handmade from solid hardwood, and popular window shutters made from Polywood, a solid wood-like material that is virtually maintenance free. These custom shutters are hand made from Basswood, a furniture-grade hardwood that is kiln-dried and sealed for moisture control. Available in 28 wood stains, 11 paint colors and your choice of either a smooth or textured finish. 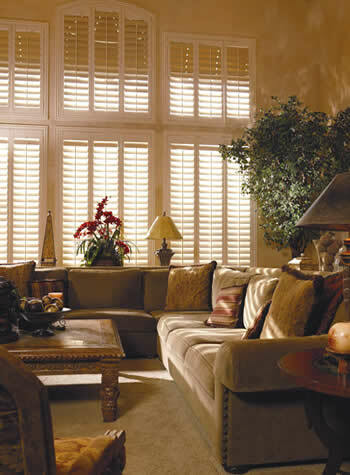 Custom Polywood® shutters have an elegant appearance and are built from a special polymer for maximum durability. 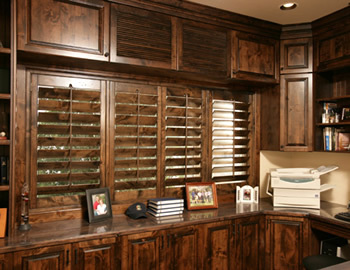 Unlike shutters made from vinyl or other man-made materials, these shutters won't discolor, warp, crack, split or peel. Available in white, off-white or bright white and your choice of smooth or wood grain finish.